Don't forget to enter your Pinterest Projects into the Challenge! Link Party closes Sunday at midnight then voting opens for the awesome prize package. Also, check out Bev's amazing pinterest project she posted yesterday. This girl can embroider! And Amanda is sharing her big reveal today! Leave them some Better Life Love in the form of comments and followers! 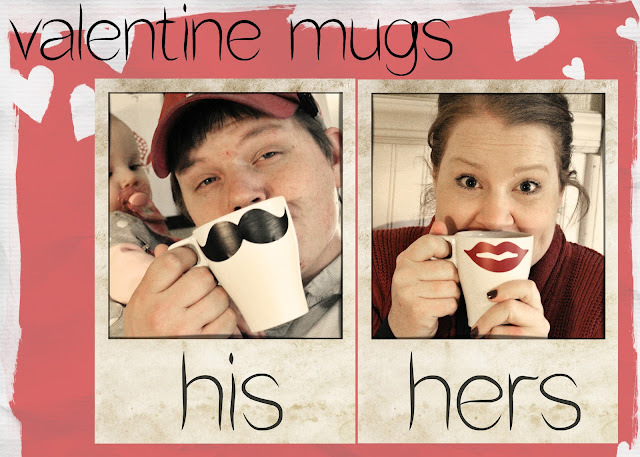 Coming up with fun, creative Valentines for my sweetie are always fun for me. And now, with Pinterest, it's even easier! Over Christmas, I pinned this mustache mug to make as a gift. I never got around to it, but remembered it last week and thought adding a sweet set of red lips would make the perfect pair! Thanks to my Silhouette, it was super easy! Just purchased an image and cut it out of black and red vinyl. We've had a blast using them! A few years ago I made this for my hubby for Valentine's Day. It was perfect because he LOVE Swedish Fish and I LOVE him. We unfortunately ate all three pounds of Swedish Fish in a matter of a few days. Whoops. It's super easy to make. I had this fish bowl shaped candy dish on hand, but it might be even more fun to go buy a NEW fishbowl at the pet store! I dumped a large box of Nerd in the bottom to resemble fish gravel and then piled up the Swedish Fish! The stickers were from Target's dollar sticker section (near the school supplies), so this all made for a cheap Valentine gift that my hubby LOVED. Don't forget to follow me on Pinterest so you can see all the cool ideas and crafts I'm posting to my "Love Your Husband" board! Great inspiration in there as well as book suggestions you all gave me on the Facebook page last week. Love the mugs. They are super cute :)!